I. A few weeks ago, we went shopping with Sus-babe and Susan. We went to Pottery Barn and checked out the kid area, where Lena was drawn to some expensive dolls and an inexpensive crib sheet (I don’t know why she liked the sheet, but that’s Lena.) We let her hold on to the crib sheet while looking around at other things, and she was enthralled by the different modes of transportation on the sheet- bicycle! Train! Bus! Truck! Car! Another car! When it was clear that snack time was overdue, I tried to exit gracefully and wanted to just put the sheet back and let the Sus-babes shop, since we’ve done fine with the two matching rocket sheets that we have and I didn’t want to introduce some kind of bedding inequality into the mix. Lena apparently decided the best way to make sure she got what she liked was to start licking the sheet in front of store personnel. Yay. We went home with the sheet, but I put it away. II. Last week, we discovered that something had entered our house through the outside dryer vent and chewed a hole in the dryer tube to get into the laundry room. We replaced the tube, but I started finding poops (not identifiable to me other than, yes, that is poop) in the room. III. This weekend, Lena and I had an epic playdate on Saturday with friends from college (one visiting, one just moved to GA) and kids. Lena played hard, ate pretty much everything we put in front of her- two red peppers, cheese crackers, turkey, mixed veggies (but not the cauliflower), two string cheeses, banana sauce, grapes, cold milk for lunch and applesauce, two more string cheeses, fruit snacks for snack, and then nearly an adult portion of pulled pork plus a full serving of her own (and some of mine) of green beans for dinner. She ate more than I did! IIII. Sunday morning, Lena woke up and still had too much food in her and it apparently needed to exit through the closest exit. There really is nothing like waking up your partner with a drive-by shouting of, “there’s a diaper full of poop on the dresser, soaked clothes, and puke in front of her closet, I’m putting her in the shower.” In all that excitement, we missed the poop + pee on her sheets until nap time. She was fine after that until snack time, when Jeremy served her a snack and Lena just puked on it. (I was out at a soccer game.) Then there was more puke, and then a shower after “dinner” (where Lena just sat with us and had a banana + juice while we ate) because she’d bubbled poop out of the top of her diaper (something we hadn’t seen when she was an infant because cloth diapers have real elastic at the top.) Yay. Also Sunday morning, we discovered that the animal had chewed another hole in the dryer hose. I’d really wanted to put the sheets I’d washed Thursday, then again Sunday morning before checking on why Lena was crying in her room right after waking up (because I’d forgotten that I’d washed them, and they included Lena’s spare sheet), into the dryer. After that is when we discovered the poop on the bed. So it really was fortunate that Lena had insisted on licking that sheet in Pottery Barn because I actually had a clean spare fitted crib sheet to put on her bed. TCB and a neighbor were outside talking. Neighbor’s son was playing in Lena’s pushcar, and Lena had decided that she wanted the pinwheels from the front porch. 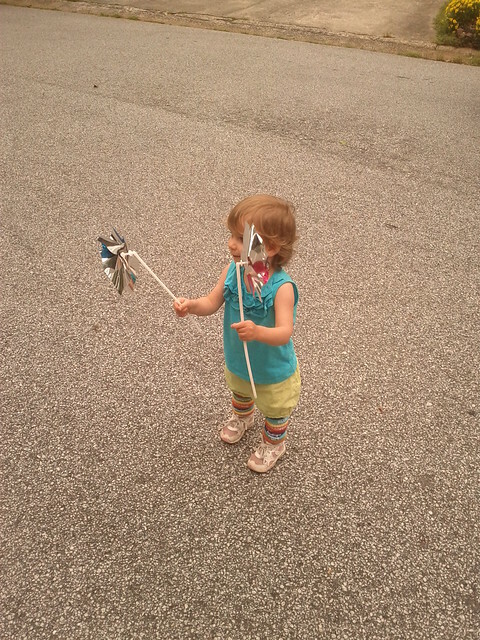 So she took off up the driveway, up the front steps, grabbed the pinwheels, and started back down the steps. She stumbled a little on the first one, but regained her composure and made her way back down the steps, down the driveway with pinwheels spinning like crazy, and back out to the cul de sac. TCB and Neighbor had watched in amazement (yes, TCB had dashed after her, but backed off once he saw that she was going to be fine with the task) and Neighbor commented that his son would have totally been crying after that stumble. With her pinwheels, Lena was as happy as a well-fed Hungry Luma. Deedle-dee-dee! Deedle-dee-dee! As I sat with TCB in the exam room after Lena’s first-year checkup, I thought about how, a year before, I’d been sitting across the hall, crying because I felt like a complete failure. And Lena cried because she was hungry. And I also cried because nursing her was so difficult. And now, I was crying because the difference was so big: I was feeding her for comfort after her shots, she was crying because of them. And nursing her was no big deal.